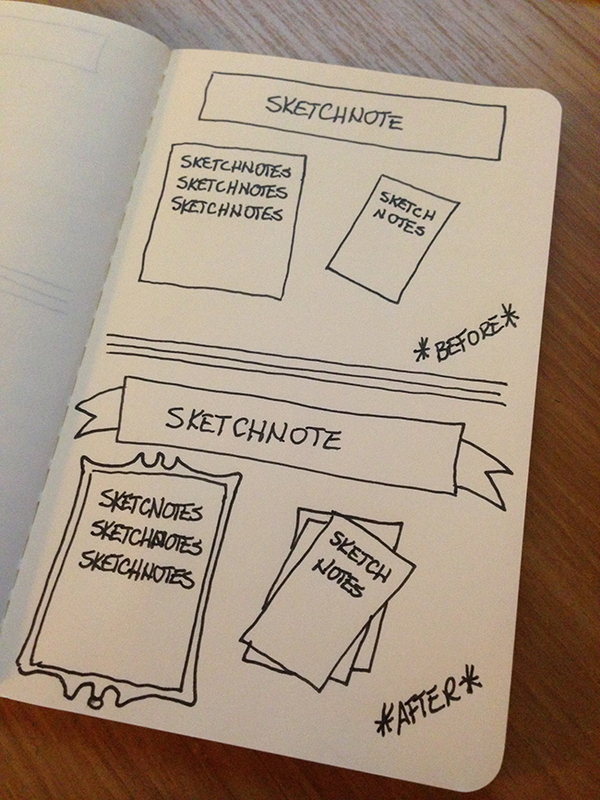 Step 1: Preparing to #Sketchnote: Live Sketching or Post-Sketching? You are here: Home / Sketchnotes / Step 1: Preparing to #Sketchnote: Live Sketching or Post-Sketching? Last week was an introduction to the series, Sketchnote School: 6 Steps to Great Conference Sketchnotes. There are a lot of pieces and parts to Sketchnoting that we’ll cover in the coming weeks. This week is the choice between sketching live in real time or saving some time later in the day for post-sketching. I often struggle with myself over the decision if I feel comfortable enough to live sketch or finish up my Sketchnote by post-sketching. I’m a pencil guy at heart because I love having more control over line weight and shading depths. Live sketching is usually with an ink pen and a commitment no doubt, but a lot depends on the speaker, the message, the room environment such as lighting, and where you’re seated. Let’s define the differences between the two approaches and their advantages and disadvantages. In the end it really comes down to your style and which method you’re most comfortable with. For all intense purposes, this approach to Sketchnoting is exactly what it says…to sketch the event, presentation, or speaker in real-time. Advantages: You are lost in an intense state of focus! If you’re new to Sketchnoting, you may find this intimidating because of the rapid state in which you are listening for key concepts. Then processing it in your noggin, deciding on what that looks like visually, and then transferring it to your sketchbook all while keeping in mind the flow of the message and hierarchical structure of your notes! Relax. That may sound like a disadvantage rather than an advantage and your sketchnotes may look like an elementary child’s doodles, but the process in of itself will deepen your skill for listening which is the main reason for Sketchnoting in the first place. Disadvantages: Live sketching can be intimidating as mentioned above because of the potential speed of the talk. The self-pressure you may feel due to not being able to keep up or hearing rapid fire concepts at one time may bring anxiety for not being able to sketch at the speed you had hoped. Mistakes used to drive me crazy! I would worry so much about a misspelling or that I crowded too many elements together that I wanted to start over. Problem is you can’t start over during a live event. You just have to go with the flow. Live sketching with ink will no doubt produce mistakes at some point and I’ve learned to embrace mistakes and simply write “oops” next to them. Mistakes Used to Drive Me Crazy! In a later post I’ll explain more about how to plan and setup your sketchbook page prior to the talk by deciding format, structure, and hierarchy. More on that later. For now, a method I’ve been using for a long time and one that was reinforced by Mike Rohde in his book on Chapter 4, Anatomy of a Sketchnote. 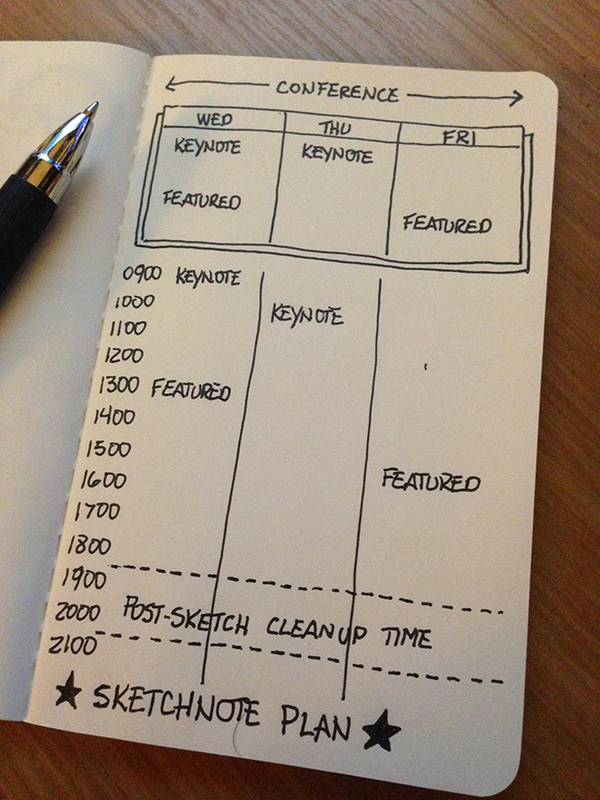 Arrive 10-15 minutes early by sketching a title or heading of the talk. This is a great warm-up exercise, too. I’ve been attending several conferences a year on a regular basis for the past 5 years and I’ve not once attended a speaker session or keynote and be surprised as to who the speaker is going to be. Event Program Guides are a sketchnoter’s friend! Find out who’s speaking, title of the talk, and any other details that will help. Usually there’s a photo of the speaker to quickly draw a silly caricature, too! There is no limit to how you set up the title. I call them Title Tops or a pre-defined section somewhere at the top of the page. It can run the length of the page like a row, a nestled box in the upper corner of the page, centered in the middle, or even smack dab in the middle of the page. You’re accomplishing two goals here: A title and some warm up exercises. During the talk, sometimes more information is pouring into your head than you can keep up. This is where I Shorthand Sketchnote. Meaning, try to capture the first word or two and the last word or two in the message where you can come back later and fill in the missing letters/words. It’s okay. 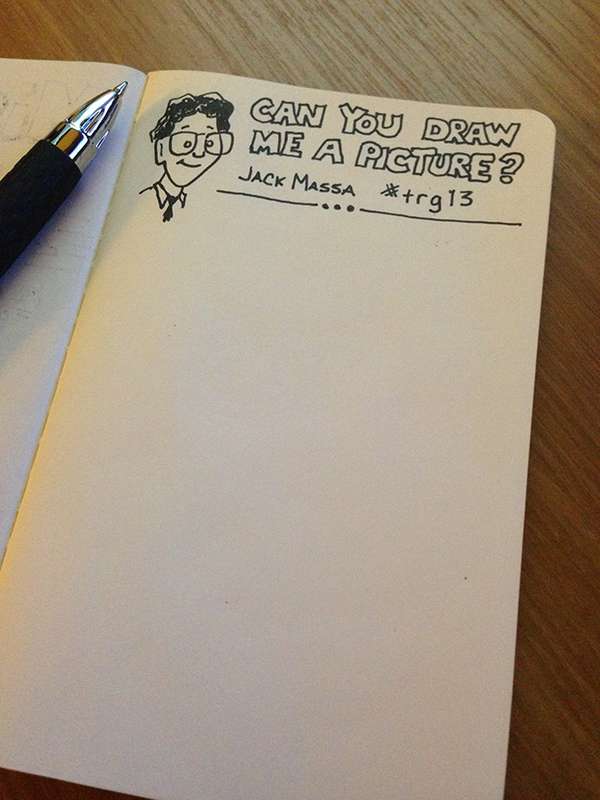 This is not cheating because you already committed to sketching it. You just ran out of time. If you can keep up with sketchnoting but lack in speed to sketch icons or recognizable symbols that support the message, draw an empty box with an arrow from the notes. Then come back later and add in the visuals elements. Again, these are tips and strategies to help you get into practice. 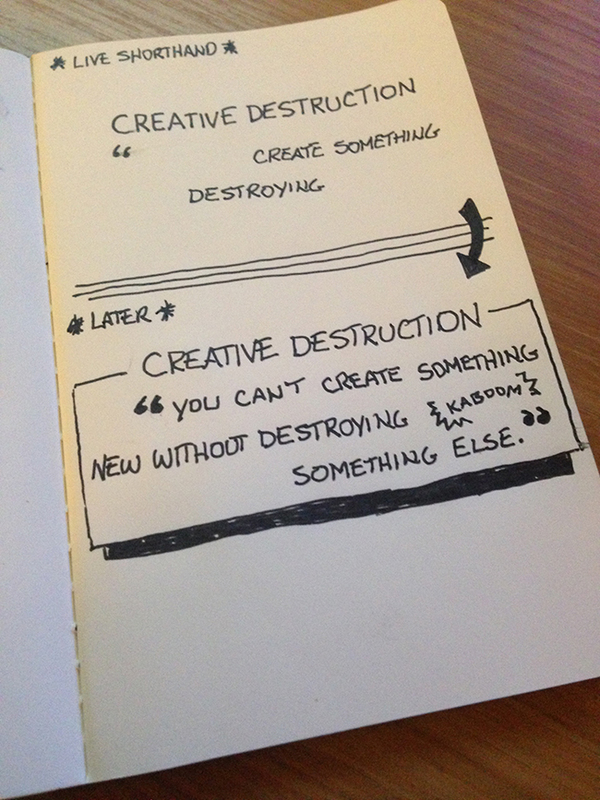 Sketchnotes at their core are for you and you alone. Their purpose is to simply help you focus and process the information coupled with better retention of what you were listening to. Only you can decide if you want to share. Last tip – for every thought you have that you can’t do this, there are ten more people thinking the same. They need YOU to show them anyone can do this. 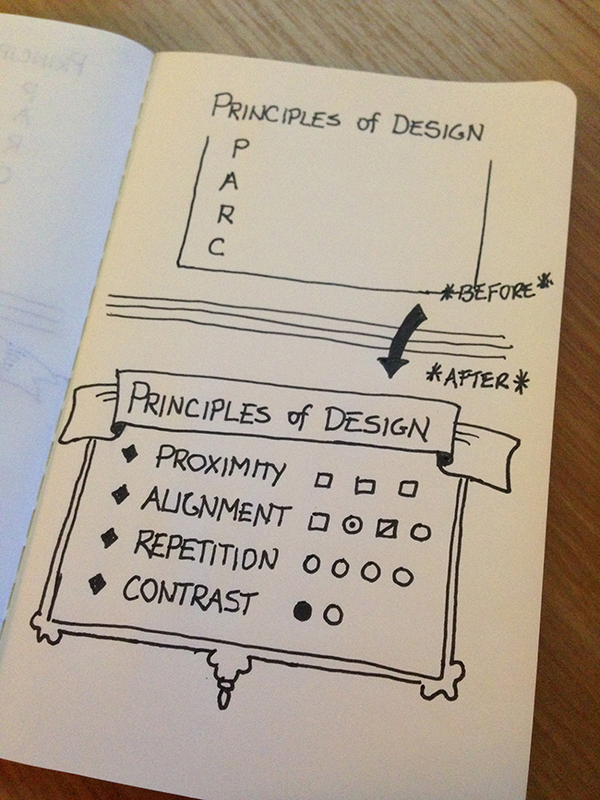 Returning to your sketchnote after-the-fact is not as exciting because the adrenaline has settled back down, but even the pros revisit their sketches to add in a few missing elements. In some cases, this is when sketchers add color to their final sketchnotes. Advantages: Sketchnoting is typically done with an ink pen, but if you’re not as comfortable with an ink pen then live sketch with a pencil and then return when you’re more relaxed and can trace over your notes with a pen. Again, this is not cheating. Remember, I can’t emphasis enough that this craft is merely a method to help you better retain information by focusing on a task while listening. If you’re sketching with a pencil all that other magic is still happening. Disadvantages: Once you start sketching with a pencil or get into the habit knowing you’ll return and “clean’ them up – two things are bound to happen: 1) you will get too comfortable with a pencil and find yourself using the eraser which sort of defeats the purpose, and 2) With all good intentions of returning to your notes you and I both know conference energy may not allow you the time. By the time you get back on a plane or home, you may not have the same motivation. First, commit 20-30 minutes later in the day on the same day as the talk. If you wait until the next day or later you may lose some of the messaging or remember the visual ideas you had for a concept. 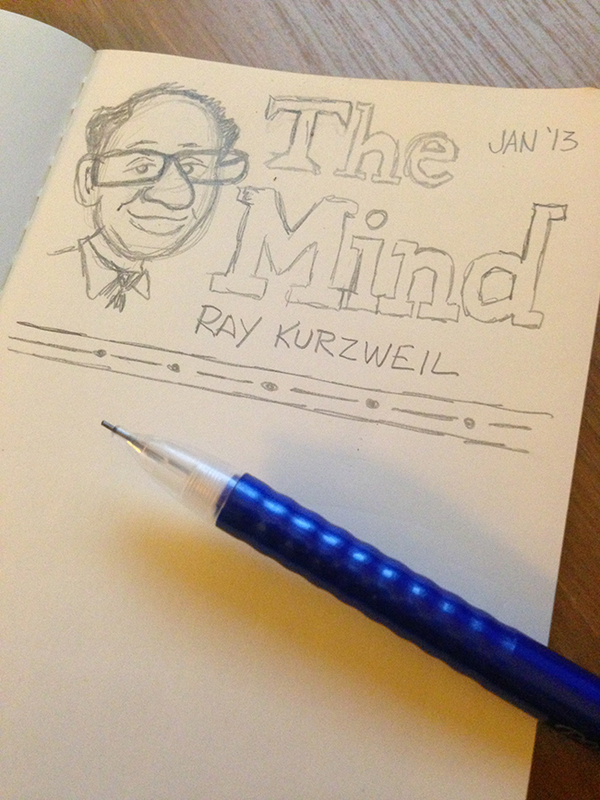 While attending conferences I sketchnote every keynote and try to sketchnote a featured speaker that same day. Typically not more than two major sketches a day. Knowing this beforehand I can block out a chunk of time later in the day where I know I can commit to polishing up my sketchnotes. Sometimes talks are slower in intensity which allows breaking points to spend time for embellishments and other decorative elements. More on that later, too. Yet, most talks move at a pace that is often difficult to draw those extra banners, borders, dividers, etc. To plan for these, simply draw a line or an outline of the element you intend to go in a particular space and then return at your pre-planned designated time to fill in the details. 2. Post-Sketch the second talk. Again, try listening to the key points and concepts and sketch as much as you can. Try using some of the tips mentioned above during the live sketch. This time you’re allowed to go back and polish up the sketch. However, pretend you’re at a large conference and you may not have a lot of time. Keep the post-sketch time at a reasonable limit such as 10-15 minutes for each sketch. Introduction – 6 Steps to Great Conference Sketchnotes. STEP 2 – Preparing: Format, Visual Flow, and Materials. STEP 3 – Characters and Locations: Who and where? STEP 4 – Text and Dialogue: Headers, Titles, Captions, and Speech bubbles. STEP 5 – Icons and Concepts: Developing your own style. STEP 6 – Action, Emotion, Color, and Adornments. Want more like this? Sign up for updates! Chief NuggetHead, Kevin Thorn is an award-winning eLearning designer with over 30 years’ experience in the training industry. Kevin earned a Technology Management degree in pursuit of an IT career. With a pencil in his pocket, his interest in technology mashed with his passion for visual design, he founded NuggetHead Studioz, LLC. The Studioz is a custom design & development company providing services in instructional design, storyboarding, eLearning development, Articulate Storyline training, illustration, graphic design, storytelling, cartooning and comics. Some great tips here, cheers! I’m new to sketch noting and have been finding it pretty hard to keep up with the speakers so these time saving ideas are great. Got a busy week ahead but will try out the assignment if I can. Cheers to you, Chris! 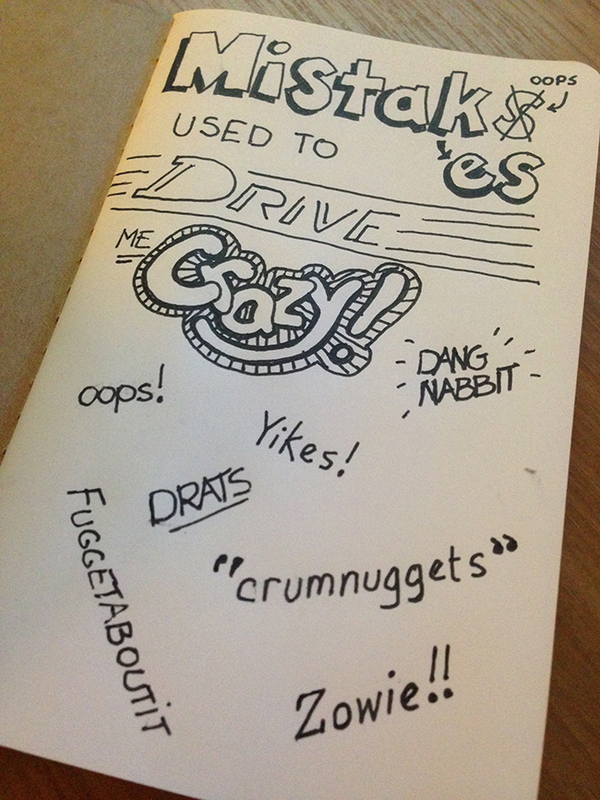 Sketchnoting is a skill and does take practice. Just like any skill, it takes time. Instead of trying to do too much, try practicing a different skill each time such as practicing lettering styles from memorable quotes. Good luck and thanks for reading!